DISAPPOINTING Dumbarton lost out 3-1 to an energetic looking Albion Rovers at Cliftonhill Stadium this afternoon. The curse of the ex-player struck twice in the first half. Former Son John Gemmell scored a brace, including a close range header, to give Albion a big advantage and the visitors an uphill task. Bryan Prunty pulled one back for Dumbarton with a scrambled goal before the break. But in a low key second period it was the Wee Rovers who maintained overall control of the game, making sure of all three points through a firm, low strike from Robert Love. HAVING led for most of the game, Sons ended up having to share the points in a 1-1 draw with visitors Forfar Athletic at the Rock today. On a freezing, windy afternoon, Pat Walker put Dumbarton 1-0 up on 16 minutes, but neither team could add to the score before the break. In the second half, Forfar were much the stronger side. Sons had one strong penalty appeal turned down, and Alan Lithgow saved them with a remarkable clearance off the line. It looked as if Dumbarton might just hang on for a win until Kevin Motion spoiled the party by heading home for the visitors in the fifth minute of time added on. Due to other results, Sons now encouragingly occupy the last promotion play-off place on goal difference. Next up is a challenging trip to Albion Rovers on Saturday 10th December. A SECOND half goal from Scott Agnew sealed a vital 1-0 win for Dumbarton against Stirling Albion at Forthbank this afternoon. Sons dominated play for large chunks of the first half, but were unable to find and convert the opportunities in front of goal that they needed to consolidate their superiority. After the break the Binos pushed back hard, but Dumbarton held on and made several chances themselves before Agnew latched on to a ball during a goalmouth scramble late in the game, slotting home past the visitors' 'keeper to give Sons all three points. Next up is the Stirlingshire Cup Final at Falkirk on Tuesday night, followed by a trip to Arbroath in the league campaign on Saturday. (29 Oct 2011). Leith is in the spotlight tonight, as Celtic, who have already lost to Hearts in Gorgie this season, seek to avoid more capital punishment in Edinburgh this evening. They face Hibernian at Easter Road, competing for a place in the semi-final of the Scottish Communities League Cup. Since the match is taking place around a mile from where I live, I was very tempted to be there. But the lure of watching the game on Sportscene and saving precious football pounds proved more of an attraction in the end, compounded by the thought of more Old Firm gloating. So far - with half-time approaching - Colin Calderwood's decision to put out an attacking Hibs line-up (partly because he lacks resources elsewhere, compared to the Hoops) is paying off, with the Leith side one up as a result of a deflected own-goal within the first five minutes. Celtic are also struggling on the left, failing to cope with deep balls, hesitating at set pieces, and squandering chances. The one that produced the biggest local cheers, unsurprisingly, was a shot that clicked off the outside of the post from former Hibee Anthony Stokes. Oh how sweet it would be to have an SLC last four without either Celtic or Rangers in it. I haven't made a League Cup Final yet, but I'd go for it if two other teams made it to Hampden. DUMBARTON had to settle for a 1-1 draw against ten-man Airdrie United in a tough game at the Rock this afternoon, with both sides missing opportunities to claim three points. A penalty converted by Mark Gilhaney gave Sons the lead on 27 minutes, following a foul against Pat Walker. But the Diamonds were level just eight minutes later, when Jamie Stevenson capitalised on a swift breakaway that left the defence stranded. The visitors' Kevin Green received a red card for pulling down a clear-through Bryan Prunty before the break. However, in the second half it was Dumbarton who often found themselves pinned back, despite their advantage in numbers. A late flurry of attacking activity from Sons failed to produce a winner. The two goalkeepers had fine games, denying the forwards on both sides on several occasions. SONS claimed their first home win of the season with a 2-1 victory against Albion Rovers and ended the first quarter of the campaign on a positive note. Dumbarton triumphed in a poor game spoiled by blustery conditions thanks to a goal in each half by Ross McKinnon and Scott Agnew. Steven Lawless gave the Wee Rovers hope with a late strike but the on-loan Motherwell man's effort was too little too late for the visitors allowing Sons to register three points and keep the Coatbridge side at the bottom of the division. DUMBARTON'S league woes continued against Stenhousemuir, as they went down to a 3-1 defeat on a dark and windy afternoon at Ochilview. An unstoppable shot from Andy Rogers before the half hour and a well taken header from Ross MacMillan just before the referee blew his whistle to end the first half gave the home side a comfortable 2-0 lead at the break. Sons had the ball in the net shortly after the restart, but Pat Walker's strike was disallowed for offside. MacMillan made it 3-0 to Stenny with a close range header on 77 minutes. Scott Agnew secured a consolation for Dumbarton shortly afterwards, curling a free kick around the home side's wall. Next up for Sons is an important game at the Rock against bottom side Albion Rovers on Tuesday night, with Airdrie United the visitors next Saturday. (15 Oct 2011). Who will reign after Spain? Well, it's Alicante and the moment of truth for Scotland tonight. Realistically, there's little chance of claiming points against World Champions Spain. As Pat Nevin has just said on BBC Sportscene, a victory here would be the best result in the Scottish national team's football history. So the weight of Euro-qualification rests heavily on Lithuania's ability to silence the Czech Republic. Six minutes in and things are looking decidedly grim. 1-0 to Spain. But even worse, the Czechs are 1-0 up in Lithuania through an early penalty. That's the one that really hurts. 8.40 Steven Naismith picks up where he left off in Liechtenstein the other night, missing an opportunity in front of goal. 34.00 To be fair, Scotland are doing pretty well, given the scale of the task. Great move between Naismith and Darren Fletcher, with the Manchester United man just failing to keep the ball down from his strike on goal. Then in a further attacking move, Alan Hutton is caught offside. An excellent wing move by James Morrison, too. 41.00 Magnificent save by Scotland 'keeper Allan MacGregor, and then, at the other end, a corner from the men in blue and a flashing shot from Charlie Adam. A reasonable shout for a penalty for a push on Gary Caldwell, too. But no-one shouted, and within a minute David Silva had made it 2-0 to Spain with a superb left-foot strike. His second of the evening. Meanwhile, the Czechs are now 3-0 in front. Game and tournament over. Congratulations, however, to the Republic of Ireland, who are into the play-offs for Euro 2012 after beating Armenia 2-1. Meanwhile, in the second half, Scotland have been doing a good job of getting behind the Spanish defence. Substitute David Goodwillie made it 3-1 with a fine, confident penalty -- and then wasted a chance to create a tap-in for Craig Mackail-Smith by blasting over the bar himself. Inexperience or selfishness: one or the other. Perhaps both. 90.00 Christophe Berra has done well at the back, incidentally, and on 74 minutes almost created a second goal with a well-placed header. Morrison could have put Goodwillie through, too. But his intended pass was too well advertised. A pretty good Scottish performance overall, despite it being a disappointing evening. 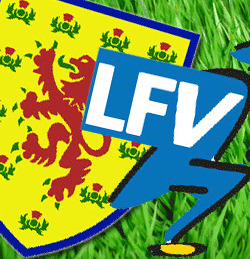 Having watched Scotland's last three games (the friendly against Denmark, and the Euro-qualifiers against the Czech Republic and Lithuania) at Hampden Park, this evening I'm settling down in front of the television with thousands of other hopeful souls as the Scots take on Liechtenstein at the Rheinpark Stadion. Greetings to all my friends in Vaduz. I'll be commenting on the action as it develops, in between biting my nails. The BBC's live stream is here. The team line-ups are as follows: Liechtenstein - Jehle, Ritzberger, Kaufmann, Martin Stocklasa, Rechsteiner, Martin Buchel, Hanselmann, Nicolas Hasler, Polverino, Beck, Frick. Subs: Benjamin Buchel, Eberle, Michael Stocklasa, Flatz, Niklas Kieber, Wolfgang Kieber, Bicer. Scotland - McGregor, Hutton, Berra, Caldwell, Bardsley, Morrison, Adam, Fletcher, Bannan, Naismith, Mackail-Smith. Subs: Marshall, Goodwillie, Robson, Cowie, Wallace, Whittaker, Forrest. What are we going to witness, I wonder? A big test for Craig Mackail-Smith, for sure. It has to be an attacking stance, too. As Scott Booth has observed on BBC Radio Scotland: "If we can look confident and take the game to them, I think we can create chances. Getting an early goal is a key thing." 18:31 A lively start, and also good to see that the Liechtenstein anthem was respected, despite being set to the same tune as 'God Save the Queen'. The pitch doesn't look good. 18:41 Charlie Adam's free kick finds Steven Naismith, who gets a head-flick to the cross. But his effort slips wide. Mackail-Smith has also had a couple of chances. Positive from Scotland, but no real signs of the much needed breakthrough yet. I think we're going to win, but probably only by a goal. 18:49 A great shot from Thomas Beck of Liechtenstein, and an equally fine save from Allan McGregor in the Scotland goal. The midfield are focussed on moving the ball upfield, but they looked dozy at the back. Mackail-Smith hits back, but he is caught offside. (Note the the BBC commentator: Brighton is not in the Midlands). 18:55 Having rounded the 'keeper, Naismith should have done much better than hitting the ball into the side-netting. Then Barry Bannan comes close. 19:03 Goal for Scotland! Craig Mackail-Smith heads over the oncoming Jehle, who has looked good so far. A crucial lead. 19:46 Well into the second half, and Scotland look comfortably in control. But they are not turning chances into more goals. Phil Bardsley has just missed a chance provided by Bannan's sweeping cross. Things are looking safe at the moment, but it only takes one slip to put the Scots in danger. 20:00 Nineteen minutes plus time added on to go, as Liechtenstein make their first substitution. James Forrest is on for Bannan for Scotland. It's going to get very tense unless Scotland can claim another goal. 20:10 Seven minutes plus left. This is a workmanlike performance against relatively low-grade, if well-organised, opposition. But Spain are going to be a different proposition altogether on Tuesday night. 20:14 Not exactly elegant viewing or a beautiful game, but if the job is done we will all be content. The bagpipes and drums sound out from the 2,000 Scotland supporters. With all the flags and banners, it almost looks like a home game. 20:18 Great attempts by Naismith and Christophe Berra, and excellent saves once more from Jehle. Three minutes time to be added on for stoppages. 20: 21 That's it, all over. Phew! Final score: Liechtenstein 0 -v- Scotland 1. Last week’s positive display and 2-0 victory away at Forfar Athletic was a real boost for Sons, and we are all hoping that the good work will continue at home against Albion Rovers this afternoon. If performances at SHS had matched Dumbarton’s away form, we would be sitting comfortably in the play-off promotion zone. As it is, we are at the other end of the table and our aim today is to put a good distance between ourselves and our visitors, to achieve stability at the Rock, and to push upwards. Today’s game will be our fourth home league outing this season, and astonishingly Sons are still searching for that elusive first point on domestic turf in 2011/12 – having leaked 13 goals during those 270 minutes of football, while scoring just four. The superstitious among my Sons friends have therefore suggested that I should stay away so we stand some chance of getting a good result. On the other hand, people who haven’t quite figured out probability theory reckon that, following three ‘tails’ in a row, a ‘heads’ is now more likely! The truth is that breaking this particular duck is a football issue, though chance and the fans obviously make a difference. As the cliché has it, “football is a funny game”, and one of its abiding curiosities is that the familiar territory of your own stadium can prove the toughest arena of all to get things right. Why? Well, sometimes there are factors at play which have little bearing on the location, like injuries, flukes, refereeing decisions, tactical changes and the sheer quality of the opposition. Even so, the level of expectation is inevitably ratcheted up on home soil. The team is playing in front of a majority of its own supporters, and – let’s face it – home fans can be the first to get on your back (“not least at Dumbarton!” I hear some of you crying). So today the men in gold will definitely be wanting some verbal encouragement from you, even (perhaps especially) if things are not going Sons’ way on the field. Ironically, just a handful of away supporters can make much more noise than a significantly larger local crew. It’s healthy lungs and the solidarity of being an embattled minority that makes the difference. Today we need to reverse that. Having been out on the pitch for 70 minutes myself, during the Play for the Sons match, I know that you pick up a good deal of what’s shouted. So it would be great if we could all make it positive this afternoon, following the fantastic example of many of our younger fans. I have an additional reason to be looking forward to this game, because the Match Ball Sponsorship has been taken out on behalf my wonderful parents-in-law from the USA, Willard and Alice Roth. I have no doubt that the traditional Scottish hospitality will be extended to them. As someone once put it, neither Alice nor Willard “know one end of a football from the other”, but I think they’ll recognise a goal if (when) Sons get a few, and sampling the local food and drink is bound to go down well. Let’s hope we’re feeling content at the end of 90 minutes, too. ’Mon Sons! Albion Rovers are ten years younger than Dumbarton, having been founded in Coatbridge in 1882. Our history has been well entwined with the Wee Rovers; particularly during the time we shared Cliftonhill as part of the transition from Boghead to the Rock, and in the recent managerial figures of Paul Martin and Jim Chapman. In 2009/10 Albion missed a promotion play-off position by a single point. Last term they put that right, earning promotion to the Second Division by beating Queen’s Park and then Annan Athletic to escape the Third Division. I saw the first leg of their play-off semi-final at Hampden, and they looked a determined, well-organised outfit. As with Sons, it has been a difficult start to the new season for Rovers, but they don’t intend to be tourists at this level. Over the years Albion’s major honours have been wins in the old and new Second Divisions (the second and third tiers respectively), incidentally. No, not Dumbarton in the Irn Bru SFL Second Division (though that too), but me in terms of reproducing match reports and summaries, posts from Changing Scottish Football and other bits of football writing (Sunday Post et al) here. I'll try to have a proper 'catch up' next week. A BRACE of goals in each half gave a well-organised, resourceful Cowdenbeath side a comfortable 4-0 victory against Dumbarton at the Rock this afternoon. The visitors were on the score sheet within eight minutes, as Marc McKenzie took advantage of a clever through-ball cutting across a square defence. Then Jon Robertson made it two after a scramble in the box on 19 minutes. At several stages in the game Sons achieved a good deal of possession, but could not break down Cowdenbeath's solidly deployed back line and creative midfield. Dumbarton came out firing in the second half, but the pattern of Cowden dominance repeated itself with Dominic Kennedy deflecting in Jordan Morton's effort under pressure on 68 minutes, and then the Blue Brazil's Scott Linton making it four with a swift breakaway goal on 86 minutes. Sons now lie one place off the foot of the second division table. Next up is an away trip to Forfar Athletic on Saturday 24 September, as they try to re-ignite their league campaign. (17 Sept 2011). DUMBARTON'S under-19s have gone out of the Scottish FA Youth Cup at Ainslie Park in Edinburgh this afternoon, after a 4-3 defeat to Spartans FC in a lively and competitive match. Sons had a good proportion of the possession in the first half, but found themselves three down to quick counter-attacking goals. Ryan Metcalfe and Ross Harvie had chances before Gary McKell pulled one back for Dumbarton, only for Spartans to strike back immediately, making it 4-1 to the home side at the break. In the second period, Sons pushed forward strongly, and Reese Pearson scored a brace to narrow the gap to 4-3. But Kevin Murphy's team could not quite achieve the dramatic comeback they were aiming for, and which the enthusiastic band of travelling supporters were urging from the touchline. An otherwise entertaining game with some good touches and performances was marred somewhat by a surprising spate of red cards. Three players from each side were sent off for infringements ranging from a push and a dive to offensive language. (11 Sep 2011). IN another high scoring game, Dumbarton were finally defeated by confident looking visitors Arbroath, going down 4-3 after leading 3-2 at half time. Goals from Bryan Prunty (5 mins), Mark Gilhaney (17 mins) and Kevin Nicoll (36 mins) put Sons in front at the break, despite two swerving equalisers from Arbroath's Lee Sibanda (14 mins) and Gavin Swankie (25 mins). But the home team slipped up immediately after the restart, allowing Swankie to claim his second goal. Then on 68 mins an infringement in the box gave the visitors a penalty kick, which was firmly converted by Steven Doris. "We had a lot of chances and the game could have ended six each," commented Dumbarton gaffer Alan Adamson. Sons now face Cowdenbeath at the Rock on 17th September, looking to get back on track in their Second Division campaign. (10 Sep 2011). SINCE Dumbarton's extraordinary feat of scoring six against East Fife in the league on Saturday and six again versus Stenhousemuir in the Stirlingshire Cup last night, one question has predominated. Have Sons achieved that in consecutive matches before? Club historian Jim McAllister comments: "We have scored six apiece in successive fixtures before. It happened on the 13th and 20th December 1958. The first result was 6-2 away to East Fife, and the second was 6-3 at home to Hamilton Accies. There may be more, but this is certainly one instance." By keeping a clean sheet against the unfortunate Fifers, Sons therefore went one better than the class of '58, of course. Indeed, Dumbarton have now scored 15 goals in three games. Not quite three competitive games, however. As Jim again points out, strictly speaking "Stirlingshire Cup ties do not count as they have different rules and are played under the auspicies of the Stirlingshire Football Association and not the SFA/SFL." Nor will anyone in the dressing room be getting too carried away. After the international break on 3rd September, it's back to tough Second Division action with successive home games against Arbroath (10th) and Cowdenbeath (17th). The lads certainly hope there will be big crowds to keep the momentum going and cheer them on to further success! My preview was first published on the official DFC website. There's more football action at the Rock this evening, as Dumbarton welcome Stenhousemuir for the semi-final of the 2011/12 Stirlingshire Cup. Admission for the game, which starts at 7:30pm and is sponsored by the Stirlingshire Football Association, will be just £5 (£3 concessions), and there will be a souvenir programme on sale for only 50p. 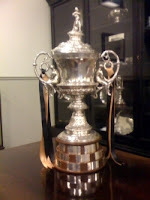 Sons have won the Stirlingshire Cup trophy twice in a row now, with the last triumph being a 2-0 victory at SHS over a young side put out by First Division big boys Falkirk on a cold night last season. Come along this evening and give your support to a Sons team seeking silverware for the third season in a row. Fourth, taking into account the Third Division Championship. My match summary was first published on the official DFC website here. Dumbarton earned their first point of the season with a creditable 3-3 draw away at Brechin City this afternoon. Sons weathered an early second half collapse and a sending off, after leading 2-0 at the break. Goals from Scott Agnew (11 mins) and Jamie Lyden (28 mins), plus some good goalkeeping from Jamie Ewings, saw Dumbarton two up inside the first half hour and well in front by half-time. But within two minutes of the restart Gary Fusco had pulled one back for the Hedgemen. Then on 51 minutes Alan Lithgow was sent off for a last-man foul on former Rock favourite Derek Carcary, and Paul McManus converted the resulting penalty. Five minutes later David McKenna capitalised on a defensive error to make it 3-2 to Brechin. Dumbarton battled hard for an equaliser, despite being a man down, and a wonderful 25-yard free kick from Agnew delivered the goods on 89 minutes. Another away trip beckons for Sons next Saturday, this time to East Fife. Hearts' new manager Paulo Sergio must have found that one of the hardest half-time talks of his career. Spurs' superiority is so great in the first-leg of the Europa League qualifier at Tynecastle, that it's difficult to see what they can do. Well, other than closing down space, putting pressure on the ball, going for man-marking, and running themselves ragged down the flanks. But it's the morale factor which also matters hugely. Whatever Sergio said, it seemed to have worked some early magic. A series of Hearts attacks, three corners, a couple of close ones - including a great opportunity when Andrew Driver cut in from the right and almost found Ryan Stevenson with a low cross. Tottenham have barely been out of their half in the first 11 minutes. And a fabulous run from Templeton, just denied by a very pacey Walker. Good to see. But then Gareth Bale breaks and makes it 4-0 to Spurs. Cruel. Let's hope the Jambos can come away from this with some dignity in tact. Fantastic breakaway goal for Spurs. Hearts fans sportingly applauding... and chanting, "We're going to win 6-5!" 5-0 to Spurs, and footballing credit to them. Men versus boys, sadly. Great to discover that the big Scotland-England clash is on ITV4 tonight. 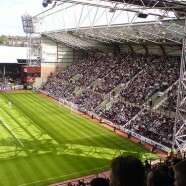 Even though I'm a Leither and a Son, I'd have loved to have got a ticket for the game at Tynecastle tonight. But it's going to be a tough watch, I fear. On paper, even a weakened Tottenham Hotspur team playing its first competitive game of the season in this Europa League qualifier against Hearts are easy favourites - they are ten times as wealthy, for a start. And sadly, due to a little defensive over-crowding and a really unlucky deflection, Spurs have their away goal within the first five minutes - Van der Vaart being the man who's done the initial damage. At the moment, just getting the ball is the Scots' main problem. John Sutton has just had a shot. But it would best be described as a long-range speculative punt. Then, oh dear, on 13 minutes Jermaine Defoe makes it 2-0 and the Spurs fans start to chant "easy","You're supposed to be at home" and "Are you West Ham in disguise?" You won't catch me saying this often, but 'mon you Jambos! I fear that their main task now is avoiding too much humiliation. (As I type this, Defoe makes it 3-0). Incidentally, the ITV commentators and summarisers haven't bothered to learn a single thing about Hearts. Such arrogance. The long road to Hampden and the Scottish Communities League Cup Final on 18th March 2012 begins here at Dumbarton this afternoon, with an ambitious first round tie against First Division opponents Dundee. It’s a match we’ve all been looking forward to for some time, ever since it was announced a full two months ago at the Ravenscraig Sports Centre in Motherwell. For Sons this game against comes on the back of a positive pre-season programme, plus our first knock-out competition triumph for a long while – Saturday’s last-minute 3-2 victory against East Stirlingshire in the Ramsdens Challenge Cup, which has earned us a second round home tie against Berwick Rangers and the chance of yet further progress. Who’d have thought it? That said, Dumbarton’s all-round performance will need to be ratcheted up more than a few notches from last weekend if we’re going to get anything out of this afternoon’s game. The first half against the Shire was a bit of a non-event. Things got exciting following the break, but then after Sons had established a comfortable 2-0 lead they almost threw it away through lack of concentration. Thankfully, Pat Walker’s final burst of inspiration rescued the tie. But the men from Dens Park are bound to be a far tougher proposition. So more than caution will be required. Sons have to dare to go out onto the pitch believing they can take the game to Dundee. Leaving aside the really big ones, which teams like ours play little or no part in, cup competitions generally have become something of a devalued currency in the world of modern football. Certainly league campaigns are a better guide to the real quality and status of a team. But there’s something energising about the unpredictability of a knock-out competition which it’s important not to lose: the luck of the draw, the light relief from routine pressures, the opportunity to play sides you don’t normally meet, the chance of an upset, the adrenalin rush… and, yes, the romance of a ‘shot at glory’. So the great thing about a game like today’s is that it means everything and nothing. If we pull off a surprise and get a win, it’ll be a tremendous boost. If not, there’s no great damage done. The target for Sons in 2001/12 is undoubtedly to secure safety in division two as soon as we can, and then to look towards the play-offs. But a bit of cup excitement would add flavour to the main task. Indeed, we shouldn’t forget that this year Dumbarton could actually end up winning silverware for the fourth season in a row. In 2008/9, Sons won the third division championship. Then there was the Stirlingshire Cup claimed in 2009/10 against Stenhousemuir, and retained versus Falkirk last term. This season we could make it three consecutive wins. Yes, I know that many regard the regional trophy as a mere ‘tea cup’ event for testing out youth players. But it actually dates from 1883/4 (the year after Sons last won the Scottish Cup, incidentally), it’s one of the oldest cup competitions in the history of football, and the trophy itself – if you have a look at it – is fabulous. Like today’s outing against Dundee, what’s not to enjoy? Unlike Dumbarton, who have never reached the final, today’s opponents Dundee have won the Scottish League Cup – which began officially in 1946/7 – on three occasions. Their last triumph was back in 1973/4 (1-0 against Celtic), and they also took the trophy in 1951/2 (versus Rangers) and the following season (against Kilmarnock). More recently they have lost out to what was fleetingly the ‘New Firm’: local rivals Dundee United in 1980/1 (when the final was played at Dens Park instead of Hampden) and Aberdeen in 1995/6. In the biggest competition, the Scottish Cup, both Dumbarton and Dundee have claimed the trophy once, Sons at the tail end of the nineteenth century and the Dee in 1910. The Dark Blues had to work particularly hard for their silverware that year. History records that it took a total of ten matches for them to lift the cup, including two replays for both the semi-final against Hibernian and the final against Clyde. The epic started in the first round with a replayed tie against non-league Beith. The League Cup, which is this year sponsored by the Scottish Government, started life as a development of the Southern League Cup – which was itself introduced in 1940, when wartime restrictions on football led to a suspension of the Scottish Cup. The final of the competition has been played elsewhere than the national stadium on seven occasions during its 64-year history. Twice at Dens Park, twice at Ibrox, and three times at Celtic Park. The long weekends of ‘no football’ (other than relentless media speculation about multimillion pound transfer deals not involving Dumbarton FC) are over. So here we are at SHS once more, watching a reshaped Sons squad limber up for the 2011/12 season with a series of home friendlies against higher-level opposition – and then two away fixtures with Alloa (closed doors) and Clydebank. Everyone says that you can’t read too much into a friendly. But that isn’t entirely true. While the result may not be a predictor, the coaching staff and players are always looking out for individual or tactical issues that need attention, and there are usually telltale signs of what is to come. Last term, for example, Sons played good imaginative football against two of this year’s pre-season competitors. The 2-1 win versus Partick Thistle was a real morale booster, and in many respects the 2-2 draw against St Mirren was even more impressive. But then Dumbarton’s frailties were made manifest by English opponents Oxford United, and we also struggled with shape and fluency in the games against Annan and the Bankies. The difference was between playing sides with a more open style that suited Sons’ best football instincts, in contrast to games where grit, grind and lack of space clamped our style. In retrospect, that pretty much summed up 2010/11. A dismal start and an uncertain ending (salvaged by an excellent display away to Second Division Champions Livingston) were clamped around a spell where Dumbarton suddenly started producing up-tempo, quality football. It was a strange mixture, but we were thoroughly relieved to stay up, and this time hope to build on the strengths and show rather more consistency. In theory, playing against promotion aspirants the Jags, from the First Division, SPL survival-or-better hopefuls the Buddies, and Cup Finalists and regular dark horses Motherwell should really test our mettle – with the on-the-road fixtures providing a different type of challenge. It looks a good mix. I last saw Motherwell live at Hampden, when they were well beaten by Celtic in a match that had moments of real quality but never quite took off. Like many I had been hoping for an upset. But since my seat was at the Hoops end, I decide to keep fairly quiet about that, and in the end had no cheers to suppress! The ’Well are a side deserving the greatest respect for what they have been able to achieve on (for the top flight) relatively slender resources. But for a club like Dumbarton, what they, Partick and St Mirren have at their disposal in terms of players and budgets is something Sons can only dream of. That said, everyone in the Second Division will be in the same economically-straitened boat this time, and there is no reason why we should not be competitive. Starting right now. Dumbarton 8, Celtic 0. How does that sound for a good result in a friendly? No, you’re not dreaming. It actually happened. Though admittedly the year was 1892 and Sons were reigning Scottish Champions! Things may not have been entirely uphill since then, but we have more past glory to bask in than many. The Scotsman recorded Dumbarton’s triumph over ‘Buffalo Bill’s’ on Saturday 2 January – though subsequent research alleges that the Wild West man switched his allegiance to Rangers. 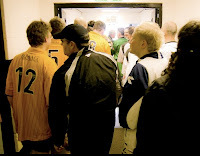 An estimated 160 plus crowd, vocal in support, turned up at SHS to watch the first ever Dumbarton supporters’ fundraising game at the Rock on 4 June 2011. There was a smattering of youthful (and some not-so-youthful) talent on display, splendidly attired in the Sons’ 2010/11 home and away strips – which the players got to keep, in exchange for subscribing up to £250 each for the club. The game itself saw a convincing win for Dumbarton Away, with the men in white pushing forward confidently in the opening stages of the game. Andy Scott in the Home goal made a fine outstretched save to his right on 9 minutes, turning a dangerous looking 20-yard shot from Alan Kennedy round the post, after the forward was set up by eventual Man of the Match Brian McMutrie. But the big sticksman – who also had a fine game throughout – then found himself trapped off guard at the far post by a tricky inswinging cross on 14 minutes, following a good cross field ball from Alan Kennedy. The uncleared ball then fell for Ian McEwan to open the scoring with a close range header. The Home side tried to regain some control in the middle of the park, but were finding it difficult to break through the Away backline, despite some good skill from Craig Campbell and Ross Black, and an effort on goal by Alex Stewart which did not really trouble Joe McCaughey in the Away goal. The match had started to even out a little when David Ferguson took advantage of a defensive slip to slot the ball just past the oncoming Andy Scott. 2-0 on 22 minutes. Scott Mackie went on an impressive run as the home side tried to push back, creating an opportunity for Chris Whitfield, Tom McAllister and Paul Duffy were also full of running throughout. But it was the Away’s midfield moving into attack which continued to impress, with Gary McMurtie and Andrew McCulloch contributing to several build-ups, while Sean Bangs, Alan Smith, Allan Clarke and Andy Mackie played tidily and looked relatively untroubled for them at the back. The substitutions were of the rolling variety throughout. For the Away side, Liam McVey was full of running and creativity. Alec Darroch tried to add sharpness up front for the Home side, and Simon Barrow came on in a defensive midfield role, but initially lost shape chasing a pacy attack before adopting a conventional right-back position in the second half. Robert Faulds made a couple of significant stops for the Homes and Darroch had a few half-chances in front of goal. In the meantime, an extended sequence of cross field passes and sweeping moves from the Aways created another opening for Ian McEwan, but this time Andy Scott beat him to the post. McVey was rewarded for all his running on 34 minutes, as MacEwan burst through the Homes’ defence and the wily number 14 made it 3-0 for the Aways. In the second half, Home centre-half Iain McPhee, who worked hard throughout, marshalled defenders Jordan Brownlee, Scott Mackie and Simon Barrow to try to close down the Aways attacking prowess. Neil Jenkinson was keen to get forward for the Aways, who always seemed keen to push the game upfield, their confidence buoyed by going in three up at the break. 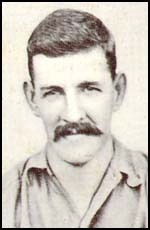 While McCaughey continued to have a relatively quiet afternoon in the Away goal, Scott was kept busy for the Home side – who, despite a number of corners and near misses, succeeded in keeping their opponents out again until the 62nd minute, when the ever-threatening Ian MacEwan rounded the ’keeper who had denied him several times, and made it a decisive and deserved 4-0. Tom McAllister for the Homes had forced a stop out of McCaughey not long before that. But the gold and blacks never really looked like scoring. Jordan Brownlee was treated for cramp not long before the end, having chased and tackled hard in the Home defence, which was also backed up by Alec Darroch. He, along with Chris Whitfield, had come closest to forcing a couple of breakthroughs at the Away end. However, the final result was never in doubt. 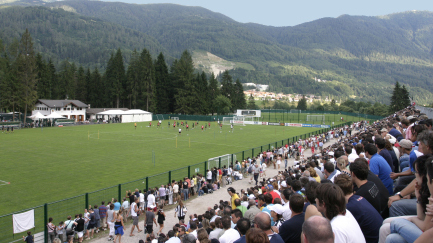 As teams in Scotland get their training regimes into gear for the new season, Bayern Munich have set up camp again in the picturesque Dolomites. Last year they comfortably beat a select IX from the Italian administrative district of Trentino 5-1. This time it was more a gentle rout, televised by Eurosport in between bouts of the Women's World Cup. The German Bundesliga outfit came out 15-0 victors. Their hosts were drawn from Serie D side Trento Calcio 1921 (also nicknamed i Gialloblu or gli Aquilotti) and some even more lowly outfits. The locals looked like they were enjoying themselves, despite the result. Next on the card for Bayern is the Qatar national side - a rather different proposition. Good fun, though. And as you can see, some stunning views. Yes, I know. 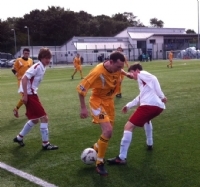 I haven't written anything about the momentous Dumbarton supporters' game I featured in on 4 June yet. Fear not, further evidence and analysis will follow. Life has just been rather full over the past week. In the meantime, here are the footballing gladiators emerging for the second half. I hove into view on 12 seconds. Such excitement! Given the other commitments players have – not least to their families after a busy season – I reckon it’s fairly unlikely that retained, past or new members of the Dumbarton squad will be in the stand this afternoon to pass polite judgement on their supporters… but a few of them (the less squeamish) might have been rather tempted to turn up! After all, they are the ones who have to put up with the ‘helpful advice’ and ‘vociferous encouragement’ that we hurl at them week in and week out. So now, for some of us at least, it’s the time of reckoning. You’re about to witness exactly how well the fonts of supporter wisdom at the Rock can do when they step on to the pitch for a full 90 minutes. Of course not everyone was so brave, reckless and foolhardy. Some of the players you’ll watch this afternoon play the game on an occasional or regular basis. A few of them turn out for the real Supporters XI… and quite a lot more mysteriously discovered that they had “something else on” or were “too old” to take part. They shall remain unnamed here. But we, the foolish, know who they are! I don’t fit into either category, incidentally. I wasn’t sensible enough to claim (rightfully, I suspect) that my 53-year-old limbs and failing eyesight aren’t really up to the job. But that’s OK. I’m sure you’ll figure that out for yourself. Nor have I played anything like regular footie of late. Actually, I haven’t stepped onto a full size pitch for 38 years. And I suspect that one was rather diddy by comparison. “Simon, this may not go so well”, my inner adult is telling be. Oh well, too late now. Of course quite a few of today’s line-ups will be taking this darned seriously. Well, we all will in a way. Football fans never remain jocular within scent of a competitive football game. But others will have to make light of their own failings, perhaps. “What options does that leave me?” I responded. “That’s easy,” quoth he. “Just tell them you’ll be the decoy!” I think you may be about to find out he’s right. Meanwhile, to all involved in this match, and in its preparation, I’m sure you will join me in sending thanks. Good luck to both teams. May mine win. And remember, should you be tempted to kick me or shout too many insults… I’m married to a lawyer! The author is no relation to the numpty on the pitch who bears a striking resemblance to him. So the FA Cup Final second half has begun, and nearly two-thirds of the executive and corporate hospitality seats are empty. Total respect to ITV commentator Clive Tyldesley for having a real dig at them, and pointing out that while they are disrespectfully ignoring the purpose of the event in order to do another business deal, stuff another prawn sandwich, or neck another drink... thousands of true football fans would have given their right arms to have their tickets. In many respects, this kind of unedifying spectacle epitomises the problem of football in the top flight(s). 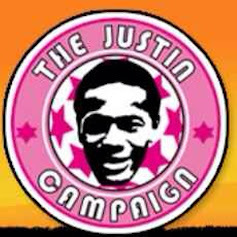 It is run and funded for the benefit of those who aren't that bothered (except by status and money), while real supporters often have to make do with crumbs from the table, and people like the EPL's exceptionally well-paid Richard Scudamore look on smugly at their "brand". Mind you, prawn sandwiches aren't much of a temptation for me, I have to confess. I'm veggie. Not that I'd miss a second of any game for even the tastiest morsel. 'Aye, sad-sack. (Ooh, Mario Balotelli's throwing a hissy-fit for Manchester City, Stoke's free kick has been scrambled away, Carlos Tevez has missed, and it's end-to-end stuff. That's more like it. 'Mon Stoke! This afternoon, the first post-season Saturday for lower league fans, presented three choices. Watch an uninspiring nothing-at-stake Hibernian versus Aberdeen clash down the street at Easter Road (and pay £22 for the privilege). Watch the Stoke City versus Manchester City FA Cup Final on the telly (a ringside seat, but with ITV's irritating ineptitude twittering away). Or, well, get a life and enjoy Edinburgh's beaming sunshine. Being a fitba man my "life quotient" was bound to be the one that suffered (after a coffee with friends in the morning and quick step-out to the legendary Christian Aid booksale), so here I am in front of the TV - cheering Stoke on. I had to spend a bit of time deciding which, of two English teams I don't spend much time thinking about, I would back. You just have to support somebody. I know more Man City supporters, but with respect to them and their Club's determination to end a 35-year silverware drought, I cannot but lend my voice to the Potteries' underdogs. They really want the historic Cup, whereas many Sky Blues have spent the week saying that it isn't nearly as important as qualifying for the European Champions League or winning the English Premier League on the back of their new-found billions. That's very hard to sympathise with as a neutral, let alone a backer of a 'diddy team'. "Fair enough," I find myself saying. "Let someone who actually appreciates this Cup's irreplaceable value and history win it, then!" Meanwhile, Manchester City manager Carlo Mancini has singularly failed to convince anyone that it really matters to him either, other than as a means of avoiding the elbow. 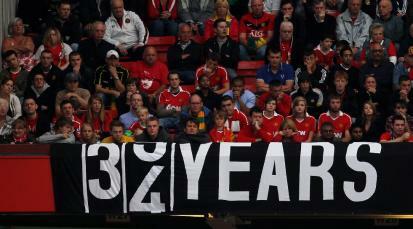 Besides, Manchester United are liable to upstage City this afternoon by winning the EPL, whatever happens at Wembley. So why not let the boys from Stoke achieve a dream far more unimaginable in the (post)modern era? So far it's been an interesting, gutsy but not over-thrilling game, 0-0 at half-time. Stoke are struggling to keep up, but defending well. Manchester City - who at least have the distinction of being the only EPL side truly from Manchester [discuss!] - have missed a couple of good chances, but will probably get more. We'll see. Footnote [17.04]: In spite of all that - well done to Manchester City, and all those who are genuinely thrilled. Someone in Manchester has won something at last *cough*. My match report first appeared on the official DFC website here. Dumbarton ended a difficult season positively at SHS, claiming only their fourth clean sheet this term in a quiet 0-0 home draw against Forfar Athletic. The result also means that Sons have finished in a respectable seventh position in Irn Bru SFL Division. In an encounter that had a definite 'end of season' feel about it from the outset, both teams moved the ball around in midfield but created precious few chances throughout the first half. Forfar's Bryan Deasley weaved around the Dumbarton defence on two occasions, running out of space and options the first time, and then laying off a header to Calum Smith which ended up nestling safely in the arms of Sons 'keeper Stephen Grindlay at the second attempt. Mark Gilhaney engineered a couple of chances from 20 yards for Dumbarton. However the home team's first clear goal opportunity came on 38 minutes, when Pat Walker set up Jon McShane for a powerful shot that blazed just past Loons' last man Neill Duffy. Jordan Halsman placed another good shot from just outside the area shortly afterwards, but it too ended up careering wide. Neither side generated much more for the remainder of the first period, and when the wind and rain set in during the opening minutes of the second half it looked as if the stasis would continue. However Dumbarton soon began to press again. The industrious and determined Pat Walker had the first real opening, latching onto the ball at Forfar's near post and whipping it towards the goal but into the side netting, almost opening Sons' account. Mark Gilhaney swung a good cross in from the far side of the pitch a few minutes later, but there was no-one coming forward able to connect with it. Then Mark Campbell had a further attempt for Forfar, before Walker forced a fine save out of Duffy, and Jon McShane used the back of his head to flick a short cross over the Loons' back two - but not their number one. Stephen Tulloch came very close for Forfar on 74 minutes, connecting with a right-angled cross while feet away from the Dumbarton goal. He prodded the ball just wide with his head, however. Sons 'keeper Stephen Grindlay also made a good stop from the Loons' Barry Sellars. Jordan Halsman was replaced by Keiran Brannan for Sons, and later on Pat Walker came off to huge applause from the home support. He gave way to Ryan Metcalfe. The last quarter-hour of the season saw several niggling fouls but little in terms of further footballing creativity, until Sons launched several last minute attacks and survived a final one from Forfar themselves. Hometown hero Paul Nugent was made Man of the Match for his defensive endeavours by game sponsors the Sonstrust. The match was not the most compelling of the season, but it left Dumbarton supporters with a point, that precious clean sheet, and the sense of a job really well done in recovering effectively from a near disastrous start to the campaign back in the summer of 2010. 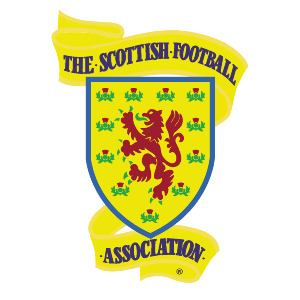 For the first time in the modern history of the game, the Scottish Football Association (SFA) has welcomed a fans’ representative to a meeting of their Council. In addition to Supporters Direct’s attendance there were also representatives of the players, managers, disabled sports and the media. The Sonstrust has continued to play a positive role in Supporters Direct – which links together Trusts across the country. Our own recruitment drive, fans’ survey and promotional activities have been warmly welcomed by SD – and we’re also helping them to launch a new campaigning blog called Changing Scottish Football. The McLeish report into the running of the SFA recommended that representatives of supporters, players, managers, coaches and referees should be involved in the structures of the SFA in order to properly represent the sport’s diverse interests. Sons fans also voted overwhelmingly for supporter involvement in the game’s governing bodies. My summary appeared first as Sons finish with a draw against Forfar on the official DFC website. Pat Walker came closest to scoring for Sons either side of the break. But neither team created many chances, with much of the play contained to the midfield and both sides missing out on the few opportunities they did create. Walker pulled a fine save from Loons' 'keeper Neil Duffy midway through the second half, and Stephen Tulloch came close for Forfar with a header that squeaked just wide some minutes later. Dumbarton fans loudly applauded the players and staff as the final whistle blew, recognising the huge effort that has gone into salvaging what looked like a sure relegation season at the turn of the year. Attention now turns to rebuilding for 2011/12. Take a bow, Sons fans! When the light dawned on 2011, things looked pretty grim in football terms for Dumbarton FC. Rooted to the foot of the table, we clearly had a fight on our hands. Today there will be a deserved celebration for having turned it around. Everyone has played an important part in that achievement, not least Alan Adamson, his backroom team and the players themselves. But whether you believe that old ‘twelfth man’ idea or not, both the gaffer and those who have worn the Sons’ colours this season have certainly appreciated the consistent, vocal support from the stands – especially on away trips. 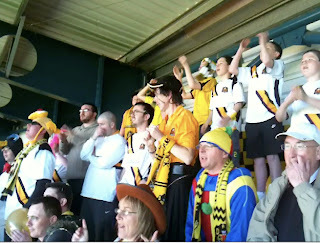 That was well illustrated at Livingston, where the Dumbarton faithful set new sartorial and choral standards – as you can see! Even the Braidwood Motor Company Stadium stewards noticed the songs, the good-natured banter and the ‘helpful advice’ directed at our opponents. “At times it was like you’d won the title yourselves!” one steward commented. The manager and players have already paid tribute to the Sons travelling support. But a big additional thanks is due to Tommy Hughes and the Sonstrust Travel Section organisers – whose hard work has kept the show on the road (literally) on good, indifferent and bad days alike! Excuse me, it’s the end of the season already? It hardly seems last week that I was picking up my first ever Dumbarton season ticket, after 41 years of being stuck in England. Mind you, for much of this term it looked like it might be relegation we’d be confronting this May. Instead, Sons are heading for seventh spot, our youth players have done us proud, and we’ve won silverware for three seasons consecutively – thanks to that second Stirlingshire Cup victory in a row. Going into last week’s encounter with Division Two champions-in-waiting Livingston, there was naturally a fair bit of apprehension. Few of us thought we would get much out of that match, leaving the likelihood that this afternoon’s one against Forfar would take place under the shadow of a possible relegation play-off. But Dumbarton’s chosen put in a fine, determined performance. That and defeats by Stenhousemuir and Alloa at the hands of Brechin and East Fife, respectively, saw us safe. And boy, was there a party! A good part of the story of that visit to Almondvale was constituted by the away support, colourfully attired and determined to keep up a constant barrage of support for the Sons of the Rock. On the pitch, meanwhile, Dumbarton were determined not to be rolled over by the rampant Lions, whose own fans seemed relatively subdued. Perhaps with two titles in a row they were taking it for granted and dreaming instead of a challenge for SPL status? Who knows. What’s clear is that the sunshine, the singing and the roll of the turf went Sons’ way. We should really have claimed all three points. But with ten minutes to go, Livi sneaked in an equaliser. It was a bit of a symptom of the downside from a bad season that ended well. What’s more, I had just finished getting the DFC website summary ready, referring to only our fourth clean sheet this term. It was not to be. So this afternoon we have chance to put that right and conclude a tough campaign on a winning note. Then it’s time to party once again, with the dance and awards event in the evening. From the perspective of football’s sporting instincts (hardly getting a good press at the moment, what with another Spanish civil war between the millionaires of Barcelona and Real Madrid! ), that 1-1 draw at Livingston put everybody in a decent mood. Sons fans stayed on to cheer out team, and also give credit where it was due to Livingston – who were evidently the standout team in the division. Earlier on the gap between them and the rest had not seemed that huge, but full-time status and deeper squad resources showed in the end. Dumbarton, meanwhile, turned an early season drought into an attack-focused approach that delivered goals and entertainment on more than a few occasions this year. The problem was that we sometimes looked more leaky at the back than my dear departed dad’s classic Austin 1100 … and though you won’t have been around to see that, even if you were old enough, believe me: that car really leaked! Newly confirmed boss Alan Adamson will no doubt have more than half a mind on ways of addressing some of this term’s problems as he seeks to reconfigure for August. But meanwhile, it’s time to try and end 2010-11 on an upbeat note, and have fun trying. Then suddenly we’ll be facing the close-season football hiatus. Having attended 34 Dumbarton matches and a few other SFL and SPL ones since this time last year (more Sons games for me than in the past ten campaigns put together), I’m a bit more adjusted to football sabbatical than usual. I know my poor wife certainly is. That said, for some of us there’s the small matter of a Play for the Sons match at SHS on 4 June to contend with. At the ripe old age of 53 it will be my first competitive game in 25 years – and you don’t want to know what happened in the last one! So after tonight’s celebrations it will be back to the strict diet and the training regime for me. Well, I say “back to”. But what I mean is, “time for my crash course in match fitness” - preferably without the crash. I need the Sons to shine on Leith for me! As for this Forfar game: well, it’s the end of a difficult chapter for the Club. But it’s also a boundary beyond which we can look forward. The desire and spirit is certainly there. So have a great summer, and see you next season. 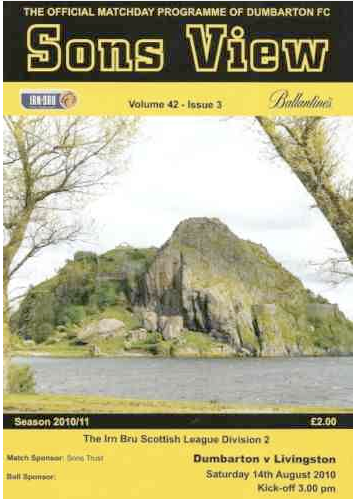 It's the final day of the season for Dumbarton. It hardly seems possible! While the campaign has undoubtedly been difficult (and we only knew for sure that we would avoid the Division Two relegation play-offs last weekend, following Sons' heroics against champions Livingston), today there's the chance to end really positively. But whatever happens on the pitch against Forfar Athletic, this evening's end-of-season awards and buffet/dance deserves to be really good knees-up! Manager Alan Adamson told the DFC website, regarding last weekend's match: "I thought we played against the best team in the division. It was an open and attacking game - something that this season that has given us problems - but we coped well, got a bit of luck and we eventually dug out the point we needed. "Pat Walker's goal was typical of the wee man who has been great for us since he signed. But singling him out would be wrong as all the lads have been tremendous for me. It's been a rollercoaster ride emotionally but we have again consolidated in the league and we now start some planning for the new season. "Forfar, who visit SHS today, have done very well indeed and deserve their play-off position bit we won't be treating the game lightly tomorrow. We sit currently 7th in the division - at 4.45pm that's where I want to remain, so we will need to be concentrating from the very first whistle." Dumbarton fans were on fine form and dressed to party at Almondvale for the match with Livingston this afternoon. Here's a bit of the unaccompanied choral output in praise of the Sonsteam! My match report was first published on the official DFC website. Amid scenes of celebration and relief, Dumbarton formally secured their place in Irn Bru Scottish Football League Division Two for season 2011-12, earning a 1-1 draw against Champions Livingston in a well-contested match. From the outset it looked to be the kind of open and attacking game that a side with nothing to lose and another with everything to gain would play - in bright sunshine, in a lively atmosphere, and with a highly vocal, colourful away support. However, despite plenty of early movement with the ball from both teams, there were no clear opportunities at either end. Then just after the quarter hour, two high and long floated balls from the respective number 7s caused Stephen Grindlay in the Sons goal and his Lions' opposite number Tony Bullock to tilt towards their crossbars. On 19 minutes, Dumbarton's Pat Walker found himself receiving a through ball right in front of the Livingston goal. 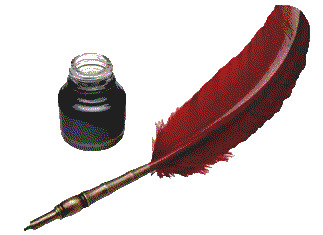 But he could not quite turn and shake off his marker, and the half chance drifted away. Moments later, with the home side unable to find a way through themselves, Jon McShane burst behind the Lions' defence, turning his defender and angling his placed shot just wide of Bullock's post. A free-kick on the edge of the area for Dumbarton produced a goalmouth scramble just after the half-hour, but Sons could not find a way through Livingston's well organised back line. The Second Division champions pushed back strongly as the half drew to a close, striking the bar off a looping and slightly unexpected header from Kenny Deuchar. Then just as it looked as if proceedings would draw to a quiet end for the first period, there was a flurry of activity. Pat Walker put Dumbarton one up on 42 minutes, skilfully latching on to a superbly and precisely placed in-swinging free kick from Andy Geggan. McShane almost added a second shortly after, but was thwarted by the keeper again. Meanwhile, at the other end, Stephen Grindlay made a fine, vital stop from a Deuchar effort at point blank range. In the second half, the party atmosphere at the Sons' supporters end continued. On the pitch, the Lions started to regain shape and composure after a ragged end to the first 45 minutes for them. But Dumbarton were not overawed, and Geggan nearly broke through as they pressed back. Iconic Livi danger man Kenny Deuchar came off 12 minutes after the restart to be replaced by eventual goal scorer Winters. He showed clear intent, firing just over from a narrow angle. Grindlay also denied Livi midfielder Liam Fox, who replaced Bobby Barr on 63 minutes. Dumbarton maintained their attacking prowess, however, forcing Bullock into another save at full stretch. For the Lions, a centrally situated free-kick from 20 yards went well over. Sons created more chances and defended determinedly under pressure until in the 80th minute Robbie Winters finally cancelled out Pat Walker's first-half strike with an accomplished equaliser as Sons wheeled back. Livingston's resurgence made for an anxious last ten minutes of the match, as Dumbarton sought to stay on level terms while waiting to hear if results involving Stenhousemuir and Alloa would go their way. Some minutes after the final whistle, confirmation arrived that Sons would indeed escape the relegation play-offs as a result of their efforts in claiming a 1-1 draw. Both sets of fans stayed behind to celebrate, with Livingston being awarded the Division Two trophy. This summary first appeared as Sons secure safety with Livi draw on the official DFC website. Dumbarton have secured their place in Irn Bru SFL Division Two with a gutsy and spirited 1-1 draw against champions Livingston at Almondvale this afternoon. A superbly taken first-half goal by Pat Walker, converting an equally fine and precisely placed inswinging free-kick from Andy Geggan, gave Sons the edge at the break. In an open game, Dumbarton tamed the Lions' and created more than a few roars of approval from a lively, colourfully attired away support. The party atmosphere was mostly at the Sons end as Livi pressed hard. Substitute Robbie Winters equalised for Livingston with nine minutes to go, but Sons held on. Fans from both teams stayed on to celebrate after the final whistle. The result means that Dumbarton's last home match against Forfar Athletic on Saturday 7 May can now be a celebration of an excellent recovery from what, at the turn of the year, seemed likely relegation. Ah well, my attempts to 'accentuate the positives' for Dumbarton's game against Airdrie United were confounded by reality. So here we are today, about to embark on the great journey to Second Division champions Livingston, still needing points to avoid the relegation play-offs... or others to fail. Realistically, you'd have to say that the chances of the Sons taking points away at Almondvale would have to be slim. But then again, this is Dumbarton. Expect either the unexpected or the worst in such stuations, the well-trained inner cynic tells me. So, fingers crossed and all that. At this stage, I reckon Stenhousemuir might just pull themselves out of the mire. So it is probably Alloa Athletic we are trying to bury - or at least concede to hades with a chance of reprieve. Sorry Wasps. But 'Mon Sons! Spanish or Catalan eyes smiling? No, I'm not just referring to the football in tonight's Champions League semi-final between Barcelona and Real Madrid, but to the complex politics, as well. 'El Classico' as it has been dubbed (or hyped) is also a clash of regions, cultures, histories and sensibilities. But this being football, the emotions are even more confused than that. On paper it has to be Barcelona for me: not just because they are the finest team on the planet right now, but because they are a fan-owned club (of a kind), were player-formed (Spanish, Swiss and English), have deep regional roots, resisted fascism in the '20s and '30s, and sponsor UNICEF. That said, there was a decidedly messy episode with skinhead groups a few years back, the UNICEF link is about to go, and as of late 2010 club membership is no longer open to the public. Only close relatives of current and former Barcelona members can join, as well as previous members with at least a two-year history of membership. Real Madrid, on the other hand, the most successful football club of the twentieth century, have been the team of many a school kid's dream for nigh on fifty years. Including mine at certain weak moments - even if my favourites European moment of all time was (and will probably remain) Aberdeen's extraordinary victory over then in the European Cup Winners' Cup Final of 1982-3. It is also difficult not to feel some affection for the current ludicrously successful, quixotic and entertaining managerial figure of Jose Mourinho, currently up against former colleague Pep Guardiola. Unfortunately, Real have also been a club of the super-rich (not that FCB are poor! ), of dictator Franco, and of the repellingly egotistical Cristiano Ronaldo. Even so, a bit of me would like to see a Madrid versus Manchester United final. An obituary to the past half century? Go figure. Meanwhile, the football in the goalless first half of the first leg of this semi has been underwhelming. The occasion, tactics and desire not to lose has overcome the sense of adventure, of which we have seen but hints so far. There has also been plenty of 'handbags' (including a spat at the break as the teams came off). The recent Copa del Rey final, won against the overall odds by Real Madrid, was both electric and incendiary. The football sparks have yet to fly in this one. My match report first appeared on the on the official DFC website. Dumbarton were beaten 2-1 by Ayr United in a hard-fought encounter at the Strathclyde Homes Stadium, in spite of a second half revival and several near chances to equalise after the break. Ayr showed their intent from the start, mounting an early series of attacks. But the Honest Men's Michael Moffat was thwarted by a fine tackle from Ben Gordon. Mark Gilhaney had the first chance for Sons, clipping a shot in from the left, which was promptly plucked from mid-air by the visitors' 'keeper Alan Martin. Then Jordan Halsman broke through for Dumbarton, but could not connect adequately for his strike. On 10 minutes Alan Trouten opened the scoring for Ayr United, passing the ball into the net all too easily after a soft through ball eluded Sons' defence. Six minutes later, following two further Dumbarton attacks, Moffatt made it 2-0 for Ayr, outpacing the defence and rounding Sons 'keeper Stephen Grindlay after he had made a stop but was then unable to cling on to the ball. The visitors' number 9 struck high into the net despite Nicky Devlin's brave effort to clear on the line. Mark Gilhaney and Pat Walker had further goal attempts blocked later on in the first period, as Dumbarton sought to retain their composure and push back. Early in the second half a searching cross-field ball from Walker released Jordan Halsman, but the young Sons left midfielder found himself just squeezed out at the near post, in spite of his trickery. On the hour a slight but well-angled effort from Gilhaney trickled tantalisingly across the face of Ayr United's goal, but ended up going inches wide. Derek Carcary then replaced Jordan Halsman for Dumbarton, as gaffer Alan Adamson sought to rearrange his pack and inject some fresh energy into the team. The sub was soon in the midst of the action, flashing a strike in fast, but high. Dumbarton were pushing forward with more urgency now, but Ayr remained steady in defence. The reward for their adventure came on 63 minutes, however, when a darting Carcary run caught the Honest Men's back line off kilter, and led to Eddie Malone tipping the ball into his own net to make it 1-2. James Creaney almost equalised for Sons minutes later, with a powerful 25-yard hit leaving Ayr 'keeper Martin at full stretch, but just missing the target. The home side continued to attack, but occasionally looked exposed from the back. On 74 minutes Creaney cleared off the line, after a goalmouth scramble almost cost Sons dear. Jordan White came on for a tired-looking Jon McShane on 76 minutes. Immediately afterwards Walker was frustratingly denied what looked a certain equaliser in the Ayr six-yard box, as Sons continued to look dangerous and purposeful - especially from the wings. Malone cleared again on the line for the visitors from Gilhaney's inswinger. On 82 minutes Keiran Brannan replaced Pat Walker for Dumbarton. Paul Nugent's strike on 84 minutes went straight into the goalkeeper's arms. In a tense and sometimes heated ending to the game, two Sons free kicks cannoned into the Ayr United wall in central positions on the edge of the area. But the vistors held on to claim the 2-1 victory and a promotion play-off place, while Sons still need points to guarantee Second Division football net season. This was first published as Dumbarton lose out to Ayr on the official DFC website. Despite a second half resurgence, Dumbarton lost 2-1 to Ayr United in a hard fought game at SHS this afternoon, with goals from the visitors' Alan Trouten (10 minutes) and Michael Moffatt (16 minutes) clinching the victory. Sons substitute Derek Carcary injected a fresh burst of energy into the game after the break. His inswinging ball on 63 minutes was tipped into the net by the Honest Men's Eddie Malone. But although they had several further chances and two late free kicks on the edge of the Ayr penalty area, Dumbarton could not find another way through for an equaliser. With Stenhousemuir also claiming a win away to Alloa, the result leaves Sons still needing points to avoid the relegation play offs.